All this while fans just knew Rajinikanth will be doing a film with A.R. Murugadoss, tentatively titled as Thalaivar 167. It was also known that Nayanthara will be paired opposite the actor. Fans were eagerly waiting to know the film’s title and other related details. And it was just yesterday (April 9) when the film’s director shared the film’s title and the poster. 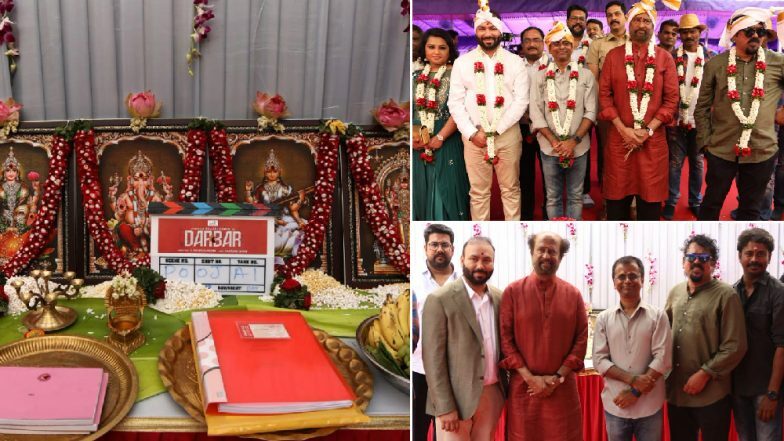 It was announced that the movie would be called as Darbar. Now the filmmaker has also shared few pictures from the film’s puja ceremony. Yes, the shooting of the film has started today (April 10) in Mumbai. Darbar First Look Out! Rajinikanth’s Next with AR Murugadoss Is a Cop Film Set in Mumbai – See Pic. Rajinikanth’s pictures from the Mumbai airport had hit the internet instantly. His pictures dropped the biggest hint that the shooting of the A.R. Murugadoss directorial would start anytime soon, and here you go! For the puja ceremony, Rajinikanth and other team members were seen, Nayanthara was not seen in attendance. This is the fourth time that Nayanthara would be working with the megastar. They have earlier collaborated for Kuselan, Chandramukhi and Sivaji. Confirmed! Nayanthara is the Leading Lady in Rajinikanth Starrer Thalaivar 167. When A.R. Murugadoss shared the first look of Darbar, it was confirmed that Rajinikanth would be essaying the role of a police officer in the film. After two decades we’d see him playing the role of a cop. The film produced under the banners of Lyca Productions is expected to hit the big screens on Pongal 2020. The film’s music would be composed by Anirudh Ravichander and the cinematography would be handled by Santosh Sivan. Stay tuned for further updates.